The major benchmarks posted another set of strong weekly gains and also closed out the month of August with a solid finish. For the week, the Dow gained +0.7%, the S&P climbed by +0.9%, and the Nasdaq advanced +2.1%. Both the Dow and the S&P notched their third straight weekly wins, while the Nasdaq booked its second straight positive week. For the month, the Dow closed up +2.2%, the S&P +3%, while the Nasdaq outperformed, up +5.7% – its best August return since 2000. For the S&P and the Nasdaq it was the best August performance since 2014, with both indexes notching a fifth positive month in a row, while the Dow gained for two months straight. The current uptrend continues, supported by positive economic data, including consumer sentiment and a solid GDP, the latest read of which showed growth coming in at a 4.2% pace, slightly better than the initial reading of 4.1%. Worries about trouble in emerging markets, notably Turkey and Argentina has not dampened overall investor sentiment which has been sustained by optimism about the domestic economy and upbeat earnings from American corporations. The American Association of Individual Investors states that 43.5% of those polled describe themselves as bullish on the market, meaning they expect prices will be higher in six months. That’s a jump of +5% from the previous week, and that takes the ratio above its long-term average of +38.5%, as well as to its highest level since mid-June. As I mentioned last week, trade is the biggest concern with investors, and this week there was an apparent easing of tensions between the U.S. and its major trading partners, after the U.S. and Mexico announced progress toward a bilateral trade agreement. We just recently marked the longest bull market in history. Such rally-runs do not die of old age rather they are generally killed by higher interest rates. The Federal Reserve will raise the short-term interest rate to curb or reverse rising inflation. At this point, inflation remains in-check, meaning less pressure on the Fed to raise interest rates near-term. 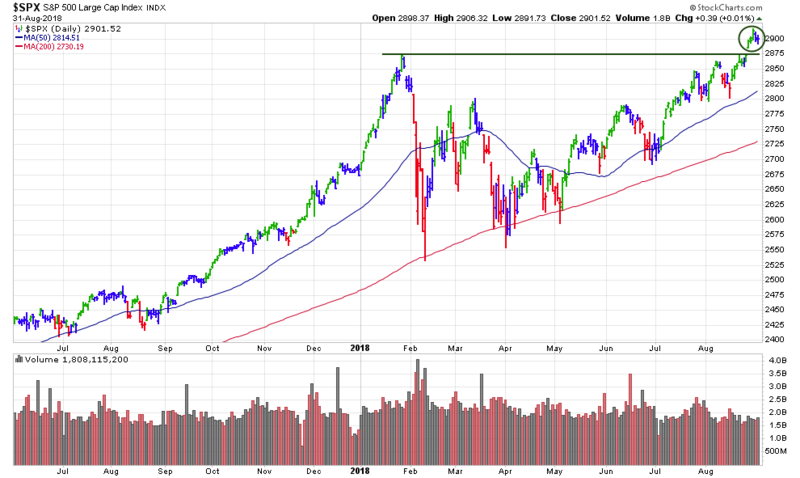 As far as the technicals, the Summer months of essentially aimless trading — where major indexes churned between a record hit in late January and a 2018 low hit shortly thereafter have now built what should be a base of support going forward. When the S&P 500 broke above that resistance and closed at an all-time high on the previous Friday — the first in a four-day-long streak of records — it not only represented a new peak, but the end of a lengthy stint of essentially sideways trading. 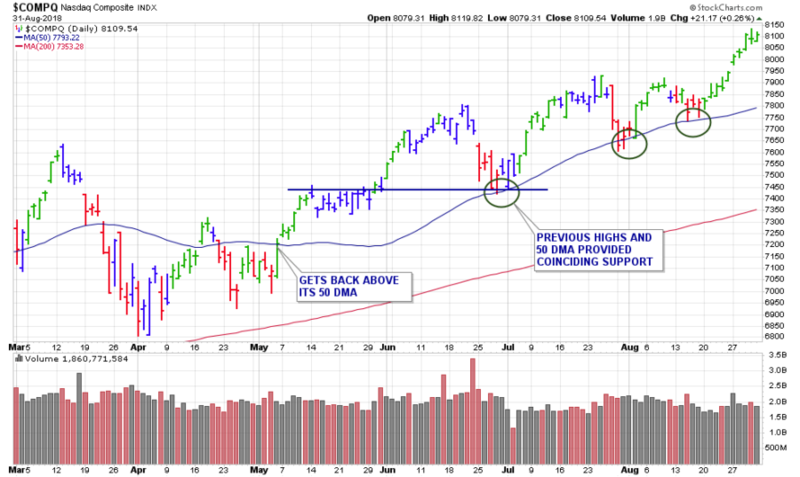 This most recent market breakout from that multi-month base and this week’s follow-through is clearly a bullish signal. After having 6 breakouts during the previous week, we had 2 new breakouts this past week (see below).